Former Gravy Train!!!! 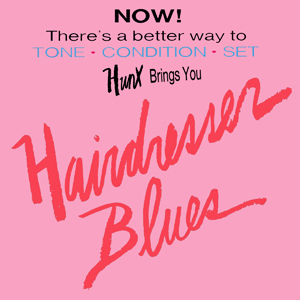 member Hunx is back with his sophomore solo album, Hairdresser Blues. Hunx is undeniably one of the most unique and memorable personas in indie music today. However, does this persona translate into a quality collection of songs? In comparison to 2011’s Too Young To Be In Love, Hairdresser Blues is, quite frankly, a tough listen. Somewhere between the two albums, Hunx‘s tunes got a little rougher around the edges – and even rougher on the eardrums. As I listened through the entire album, the question weighing on my mind the most was “what happened to the Punx?” It turns out that Punkettes Amy Blaustein and Michelle Santamaria quit the group last summer to be replaced by Kyle Thomas and Daniel Pitout. Although Hunx retains his sassy, rockabilly, queercore persona, it can sometimes be overbearing without Blaustein and Santamaria in the mix to soften some blows. That isn’t to say that Hairdresser Blues is totally unlistenable. “Do You Remember Being A Roller” and “Set Them Free” are the most palatable tracks out of all ten. Both are slightly more polished and show the most character without surrendering the sass that listeners have come to expect from Hunx. Although it is possible that Hunx simply has to work out some kinks since the departure of his Punkettes, I would prefer to hear his crude tunes backed by some feminine nuances.